President Recep Tayyip Erdoğan (L) meets with U.S. President Donald Trump during the U.N. General Assembly in New York, U.S., Sept. 21, 2017. In the last couple of years, Turkish-American bilateral ties have seen dramatic fluctuations due to persistent issues – that the two allies have to look into and resolve. Issues, including Syria, the S-400 missiles and the extradition of Fetullah Gülen, the mastermind of the July 15 coup attempt orchestrated by the Gülenist Terror Group (FETÖ), have led to mounting tensions between the two partners. Aware of the high stakes, neither side has resorted to cutting ties but has maintained dialogue in multiple spheres, particularly on the economy. The latest initiative to keep up the positive dialogue is the 37th Annual Conference on Turkey-U.S. Relations that kicked off on Sunday with the theme "Back to Business: Maintaining Partnership in Difficult Times" in Washington, D.C. Both Turkey and the U.S. are determined to mend their ties by way of capitalizing on long-standing economic partnership. 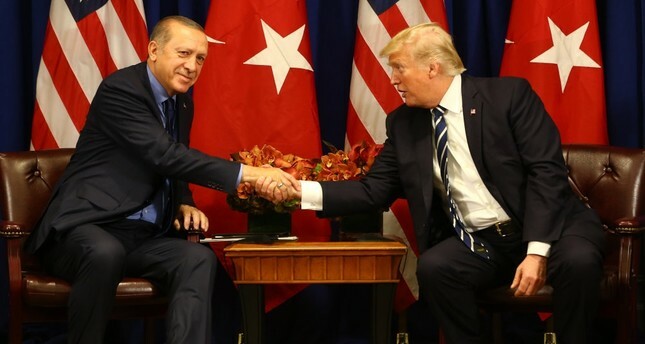 As the title of the meeting suggests, Turkish-American ties are undergoing "difficult" times due to ongoing disputes, particularly over Turkey's decision to purchase the Russian-made S-400 surface-to-air missile systems due to which the U.S. has threatened not to deliver the F-35 jets of which Turkey is a joint producer. These difficult ties also include U.S. policy in Syria supporting PKK-affiliated terror groups threatening Turkey's national security. Despite these issues, the opening remarks at yesterday's conference underscored that the current crisis must be dealt with and that economic relations are key to resolving these problems. From a historical perspective, early economic dialogue between Turkey and the U.S. began with the Economic and Technical Cooperation agreement signed in 1947 with a view to implementing the Truman Doctrine in the aftermath of World War II. While the strategic political and military cooperation expanded with Turkey's membership in NATO in 1952, the economic partnership grew more exponentially as Turkey welcomed more American companies. Currently, 1,853 American companies mainly operate in Turkey's retail, e-commerce, finance, energy and technology sectors. The U.S. also ranked second in Turkey's foreign direct investors with $11.8 billion in the period of 2002 to January 2019, according to the foreign direct investment (FDI) statistics released by the Industry and Technology Ministry. It is reported that U.S. direct investment in Turkey is led by manufacturing, wholesale trade, finance and insurance. Although overall U.S.-Turkey bilateral trade jumped from $10.8 billion in 2009 to $20.5 billion in 2018, it remains modest compared to its potential. Therefore, President Recep Tayyip Erdoğan and U.S. President Donald Trump agreed to raise the trade volume to $75 billion. Both Turkish and American businesspeople have voiced their strong support for the trade target and this year's conference was drafted in accordance with that goal, deliberating on ways to reach $75 billion in trade. Top export categories include machinery, vehicles, carpet and other textile coverings, iron and steel and their products as well as agriculture, stone, plaster and cement. The top items of imports from the U.S. include aircraft, mineral fuels, iron, steel, machinery, cotton and agriculture. "The U.S.-Turkey relationship has a special place," İbrahim Kalın, the presidential spokesperson said at a reception held ahead of the 37th Annual Conference on U.S.-Turkey Relations, organized by the Foreign Economic Relations Board of Turkey (DEİK), the Turkey-U.S. Business Council (TAİK) and the American-Turkish Council (ATC) in Washington. "With President Trump coming into power, the two presidents have developed a good relationship. They have good chemistry," Kalın said. Stating that the two counties have faced a number of issues over the past two years and continue to address the issues, Kalın said the friendship of the presidents has "played a significant role" in preventing the issues from turning into crises. "We have issues to address, no doubt, but I think it's these kinds of platforms, meetings and people like you that can provide a venue, a platform to address these issues in a way. That's based on shared interests, as well as common values and objectives," the presidential aide stressed. For his part, Serdar Kılıç, Turkey's ambassador in Washington, also said that Turkey-U.S. relations have "flourished on the bases of common values, mutual interest and shared objectives." "Despite suggestions by some, it is my firm belief that Turkish-American relations are as important and as relevant as ever," the Turkish ambassador concluded. Elaborating on the S-400 row between Ankara and Washington, Defense Minister Hulusi Akar yesterday said in Washington "threats, ultimatums and deadlines do not help and they were not in line with alliance spirit." Ankara's decision to acquire the S-400 defense missile system from Russia has been the number one issue among Turkey and the U.S., straining already tense relations. Washington has been attempting to push Turkey to give up on its S-400 decision, calling it a step that would trigger Countering America's Adversaries through Sanctions Act (CAATSA). CAATSA came into effect in July 2017 to be imposed on companies or countries doing business with Iran, Russia and North Korea. On a number of occasions, Turkish officials stressed that the deal was completed before the introduction of CAATSA. Another contentious issue for the purchase of the S-400 system is that the U.S. stresses that they will reassess Ankara's participation in the F-35 fighter jet program and other potential future arms transfers to Turkey. In its first concrete step, Washington recently suspended the delivery of parts and services for F-35 fighter jets to Turkey over Ankara's S-400 decision. U.S. officials have suggested Turkey buy the U.S. Patriot missile system rather than the S-400, arguing it is incompatible with NATO systems and would expose the F-35s to possible Russian subterfuge. Turkey has responded that it was the U.S.' refusal to sell it Patriots that led it to seek other sellers, adding that Russia offered a better deal, including technology transfers. Officials have said that Turkey's decision to acquire S-400s is the result of a comprehensive calculation of geopolitical risks compelling the country to look for alternatives to strengthen its defense systems after the U.S. refused to sell similar defense weapons to Turkey. When Turkey wanted to buy the Patriot missile system from the U.S. in 2009 during then-President Barack Obama's term, U.S. Congress declined to sell Patriot PAC-3 batteries worth $7.8 billion at the time. Turkish officials refuse to back down from the planned purchase of the S-400 systems, which, according to Turkey's NATO ally, the U.S., would compromise the security of F-35 aircraft. NATO previously indicated that the acquisition is Turkey's national decision and does not contradict Ankara's position in NATO. Turkey has remained unfazed in the face of threats from the U.S., with many officials repeatedly stressing that the S-400 deal is not a threat to NATO systems and is not on the table to be used as a bargaining chip against F-35 jets and Patriot negotiations. Speaking to journalists accompanying him during his visit to Moscow, where he attended the opening ceremony of the Turkey-Russia cross-cultural year and held bilateral talks with Russian President Vladimir Putin during the Turkish-Russian High-Level Cooperation Council meetings on April 8, President Erdoğan said the purchase of the Russian-made S-400 defense systems is a decision made against external security threats, adding that the step taken for Turkey's national security does not target a third country nor does it authorize a third country to have a say in Ankara's sovereign choices. Erdoğan said there is great international interest in Turkey's S-400 decision and that Turkish ministers are frequently being asked whether there has been a change in Ankara's position on the S-400s. "We tell them 'this is a job completed, all is ready.' The delivery of the S-400 missile defense system was supposed to be in July, it may be done earlier," the president said. In his address Monday at the 37th Annual Conference on Turkey-U.S. Relations, Defense Minister Hulusi Akar also warned that a safe zone in Syria should take Turkey's security concerns into consideration. "A possible safe zone should address Turkey's national security concerns," Akar said in regard to the establishment of a safe zone along the Turkish-Syrian border. Ankara puts top priority in the complete control of a safe zone planned in northern Syria to drive away the PKK-linked People's Protection Units (YPG) from the Turkish border. U.S. Syria Representative James Jeffrey also drew attention to the importance of the geostrategic partnership between Turkey and the U.S. "We are now working on a safe zone with Turkey, on which we have not reached any final agreement. Turkey has very significant security concerns," he said and emphasized that the U.S. comprehends Turkey's concerns related to the PKK-affiliated YPG group which the U.S. has used to fight Daesh. "In cooperation with Turkey, we are devising a safe zone which excludes the YPG," remarked Jeffrey. Turkish authorities have repetitively demanded that the U.S. disarm the YPG and has proposed a "safe zone" of 30 kilometers into Syrian territory along the border with Turkey, which would be under Turkey's administration, to eliminate the terrorist threat. Turkey's NATO ally, the U.S., however, continues to arm the YPG and regards the safe zone as a buffer zone to protect its ally on the ground and seeks to deploy Western or international forces to supervise this zone, something Turkey cannot tolerate. The safe zone discussions heightened after Trump in December announced that the U.S. would withdraw its troops from Syria, saying that Daesh was defeated and Turkey highlighted that it will monitor the areas from which U.S. forces would withdraw, prioritizing its national security. Ankara has been infuriated by the U.S. support for the Syrian Democratic Forces (SDF), which is dominated by the YPG, under the pretext of fighting Daesh. The U.S. provided military training and supplied truckloads of weapons to the YPG, disregarding warnings from Ankara that the YPG is organically linked to the PKK and that partnering with one terrorist group to fight another was not acceptable.